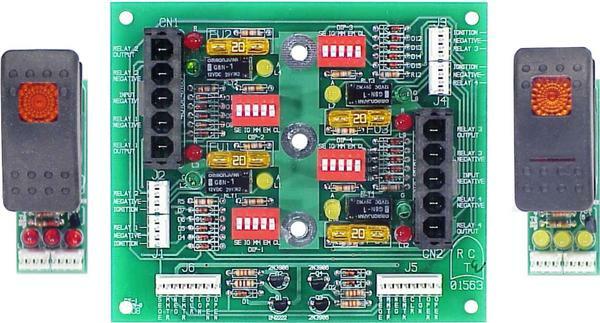 Adds four circuits to the Ambulance Power Center, RCT-01479. When ordering this control the switching (RCT-01564) must be ordered as well. Switches that can be used. "ON-OFF-ON" or "ON-OFF". Either maintained or momentary. When using "ON-OFF-ON" switch , two of the four power relays on the Aux. Power Card, RCT-01563 will be used. Document: RCT-01563-00000 Ambulance, Aux. Power Card. Muncie Transit has been specking the RC Tronics unit for about seven years and we've racked up well over 2 million miles of rugged stop and go city service on them without a single failure. They have been an integral part of drastically improved electrical system dependability in our fleet. We have experienced sharp reductions in electrical system related road calls and believe the RC Tronics product has played a major part in that success. We first tried them on two pilot vehicles and within a very short period of time became believers. We've specified them on all our Para transit vehicles since then. Ted Gaston, Director of Maintenance, Muncie Indiana Transit Systems (MITS), Muncie, Indiana. All products manufacured by R.C. Tronics Inc. are warranted to be free of defects and material or workmanship. Liability is limited to repairing or replacing at our factory, without charge, any material or construction defects which become apparent in normal use within the warranty period following the date the equipment was shipped. All images & Content Copyright 2006 R.C. Tronics, Inc.